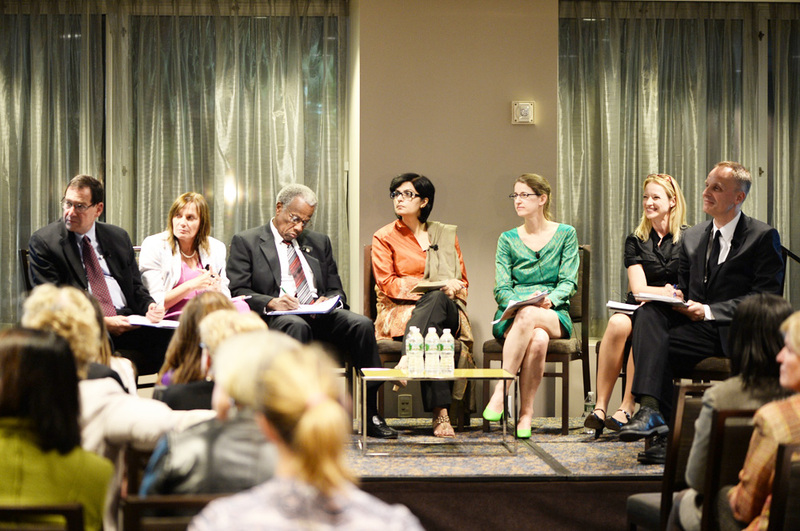 September 26, 2013: The United States Government, Permanent Missions of CARICOM to the United Nations, the NCD Alliance and the NCD Roundtable jointly hosted a side event in New York, on the margins of the UN Special Event on Millennium Development Goals (MDGs) early this week. This high-profile multi-stakeholder dialogue – Healthy Planet, Healthy People: Building Synergies for Sustainable Development was opened by HRH Princess Dina Mired of Jordan and featured a vibrant panel discussion on bridging health, NCDs and sustainable development. Richard Horton, editor of the Lancet moderated this full and dynamic panel, where our president, Sania Nishtar joined Ambassador Jimmy Kolker, Sir George Alleyne, Marie-Paul Kieny, Sarah England and Lisa MacCallum for discussion on the exiting next steps towards the post-2015 global health agenda, where NCDs are likely to be featured more prominently than they have been in global health priorities. The government has established an organisational framework for national security by reconstituting the Defence Committee of the Cabinet (DCC) as the Cabinet Committee on National Security (CCNS). While the committee formulation remains the same, the new entity has a broader and more significant mandate. As opposed to the DCC, which had an advisory role, the CCNS has been given a policymaking mandate with the responsibility to frame a national security policy. There is a popular notion in Pakistan that a policy is what is stated officially and articulated formally. However, according to a ‘utilitarian view’ in policy jargon, a policy is what a government does. It is not just an official policy pronouncement but also any form of government order, posturing, and positioning that constitutes official government policy. By that measure, each of Pakistan’s past governments had a stance on national security. Therefore, the first step in formulating a new – and more formally articulated – national security policy should centre on a review of past policies or the lack thereof and their impact to yield evidence for new norms. It is also critical to view national security in a holistic manner. Some of the threats to the viability of the state and society do not emanate within the traditional national security paradigm, but outside its confines and have complex ramifications. Six dimensions of national security are outlined here. The first centres on a traditional view of national security, which defines security as “the requirement to maintain the survival of a nation state through the use of economic, military and political power and the exercise of diplomacy.” In this context, the policy on national security has to take cognizance of new threats. Cyber insecurity and information warfare are examples of emerging challenges. Internal security is the second dimension, where there is need for policy approaches to the deep-rooted determinants that manifest themselves as extremism, terrorism and militancy. There is a history of how these have evolved. At the core, the scale of distortions in Fata has been a blind spot for every government; the collusion between the administration and local chiefs has created a breeding ground for illicit economic activity. This milieu is deeply interlinked with today’s internal security issues, especially when viewed in the context of our foreign policy towards our western border. In addition, our inability – or unwillingness – to exercise oversight over the flow of external money, which fuels proxy wars on our soil, has been most damaging. By doing so, some countries have furthered their ideological influence by exploiting our illiterate masses and in the process have also cultivated extremism and sectarian strife. Our massive informal and black economy has created the perfect channel for moving money to further these and other objectives. Complicating the situation further is political support to militancy, which has cultivated bandits who carve territories on ethnic grounds, impose illegal ‘taxes’ and pitch communities in deadly confrontations, causing tragic human toll and the breakdown of law and order. These issues are not one government’s creation nor are they likely to be amenable to solutions within the term of one administration. This further highlights the need to have a convening mechanism for stakeholders to draw up a mega-manifesto, which can insulate planning for the needed directions from policy vacillations inherent to change in government. Third, if security also implies preserving the federation, then the national security policy should also focus attention on the fault lines, perhaps created inadvertently by the 18th Amendment. By vesting the ownership of natural resources in the provinces in the absence of robust provincial systems to manage these complex federal-provincial relationships, the amendment may have sown the seeds of inter-provincial discord and laid the foundations of a confederal structure. During my stint as a federal minister, I could sense a lot of hostility between the federal government and the provinces. The provinces simply don’t have the incentive to create a common economic union. By additionally overlooking to grant the federal government the mandate to act as the equity lever among provinces – which is its core function in a federal system and essential for national cohesion – the amendment has additionally raised another national security concern. The fourth dimension of national security centres on human security; while the former centres on the state, the latter relates to the people. Both are deeply interlinked. Human security in turn has seven dimensions – economic security, food security, water security, environmental security, personal security, community security and health security. All these dimensions are mutually interlinked and are intertwined with state security, but their solutions lie outside the purview of the national security apparatus. For example, Pakistan’s energy insecurity has become a grave threat to an economy already mired in debt – the greatest risk to sovereignty – and challenged by fiscal pressures and deteriorating investment climate. The economy is deeply dependent on agriculture. Being an agrarian country with the fourth highest risk of becoming water stressed raises grave food security concerns, especially when arable land is being leased by other countries that are planning to secure their populations from the impending food security crisis. There is also a significant interplay of the ‘environment factor’ in the food security equation. As one of the top 20 global warming hotspots in the world, climate change is now palpable with unprecedented floods and change in monsoon pattern. All these factors contribute to rising poverty and deprivation; that in turn has a causal linkage with conflict and violence in a society, which is additionally compounded further by the previously described factors that have led to our internal security conundrum. A vicious circle is clearly evident, which is stressing people on the one hand and rendering the country vulnerable on the other. Many other examples can be highlighted to illustrate the interconnectedness of risks. Closely interlined with the seven pillars of human security is the fifth dimension of national security, centred on demographic security. Pakistan is the sixth most populated country in the world. We are estimated to reach 245 million in 2030 and 302 million in 2050. If the rapid increase in youth is not paralleled with commensurate economic opportunities, we risk creating a force ready to be tapped by forces that have found creative ways of exploiting their weaknesses. Recognition of this dimension flags the need to regard policy approaches to population planning a national security objective. However, the most important threat to national security is never really recognised. Most of the security related problems today – extremism, militancy, ethnic strife, organised criminal activity, etc – are all manifestations of the disease. The true reasons are lack of accountability, answerability and arbitrariness in decision-making, which have enabled these issues to take root. Unless these critical weaknesses in state governance and government are addressed at the core in a holistic manner, the true threats to national security will remain unaddressed and we will continue to risk our people, our country and our rightful place in a globalised world. September 2, 2013: healthcare quality regulation has been an orphan area in Pakistan’s public policy. In our recent Oped, and blog-post, the suffering of an unfortunate woman have been highlighted to make a case for urgent policy action.